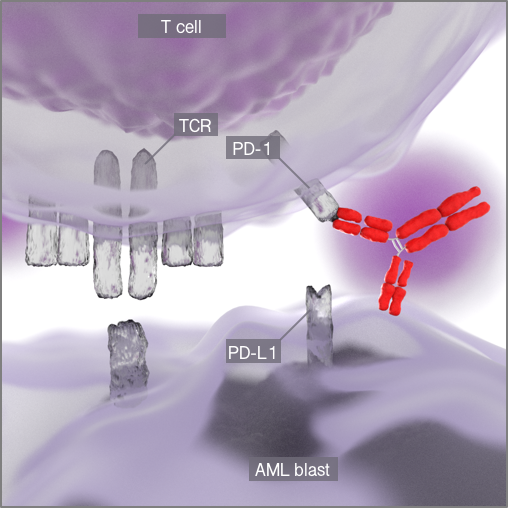 Therapeutic vaccination with autologous dendritic cells (DCs) loaded with leukemia-associated antigens (LAAs) is a promising treatment strategy to induce anti-leukemic immune responses and to eradicate chemo-refractory cells. Using a TLR7/8 agonist, we have developed a GMP-compliant 3-day protocol to differentiate monocytes of intensively pretreated AML patients into highly functional, therapeutic DCs. 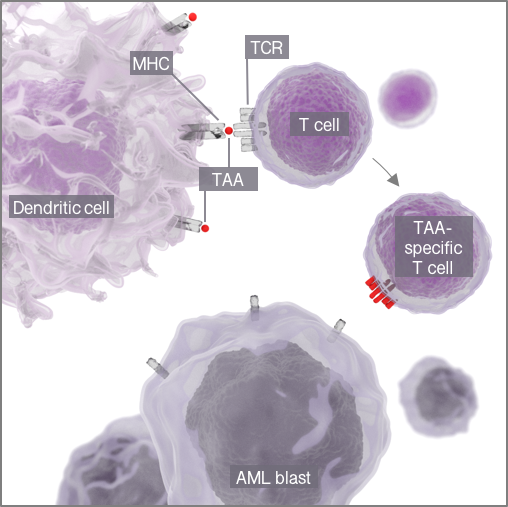 tumor-associated antigens (TAA) on dentritic cells. A phase I/II proof-of-concept study was initiated using TLR7/8-matured DCs as post remission therapy of AML patients with a non-favorable risk profile in CR or CRi after intensive induction therapy (NCT01734304). DCs were loaded with in vitro transcribed RNA encoding the LAAs WT1 and PRAME as well as CMVpp65 as adjuvant and surrogate antigen. Patients were vaccinated intradermally with DCs of each antigen species up to 10 times within 26 weeks. The primary endpoint of the phase I/II trial is feasibility and safety of the vaccination. Secondary endpoints are immunological responses and disease control. We aim to improve vaccine efficacy by combinatorial approaches using hypomethylating agents. Immune responses were markedly increased by combination of DC vaccination with azacitidine. Monoclonal antibodies against checkpoint molecules were applied with the idea to unleash pre-existing anti-tumor T cell responses. In most hematological diseases, the endogenous anti-tumor response appears to be low, therefore making combinatorial approaches using vaccines and checkpoint molecules to augment immune responses an attractive treatment modalities. Different checkpoint molecules and its relevance in activation and inhibition of APC-induced immune responses are being explored (Bayimmunet, I-Target).